Mass Surveillance - 3200 Cameras Exposed in San Diego! Its 2019, and we’re living in an era with eyes all around us, and I mean literally! Gone are those days where you could head outside for fresh air or take a walk down the street without having to fear anyone prying on you. With digital advancements taking over our daily lives, we are either being tracked on the internet or watched by the entire world. Yes, you read that correct. Security cameras which are supposed to provide security have now ended up exposing our privacy. It’s is most definitely something we should be talking about and highlighting others so that we do our part in restoring privacy that should have been secured from day one. 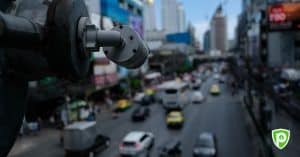 Ever thought of a city in the United States secretly creating a Chinese-style public surveillance network that can identify everyone? Yes, that city exists and it’s no other city than our beloved, San Diego, California, the fun-filled city that hosts Sea World and the San Diego zoo is disseminated with secret surveillance cameras that monitor your every move. Can you imagine that same city secretly creating a Chinese-style public watchlisting network? Talk about surveillance. Well, imagine no more because it has already happened. Covert facial recognition street lights have been installed in San Diego, making your worse privacy fears become a reality. An outspoken critic of the mayor, Kevin Faulconer, leaves her downtown condominium en route for her law office a few blocks away, monitored by an array of video cameras and audio sensors concealed atop the city’s streetlights. Each day, the routine is the same, and each day each minute detail of her activity is captured in a massive database for subsequent perusal by unknown actors. Yes, that’s the reality we live in. Whether its lawyers, politicos, businessperson, journalists, actors or simply grannies who are out for their daily work, thousands of private citizens are recorded every second and their potentially compromising information is kept away on remote servers. These remote servers do not possess the adequate security measures which ensure their safety. What’s worse is that the information which consists of audio and video recordings is readily available to people in power such as city officials, law enforcement agencies, and companies who bank the pocket or the connections to purchase this data. Privacy critics are strongly against the idea of open surveillance. The concept of surveillance goes against the basic rights of individuals which is to be able to express and roam free without anyone snooping on their moves and viewing that footage from across the globe. In a letter to the mayor and city council of San Jose, the American Civil Liberties Union, the Electronic Frontier Foundation, civil rights advocates, Muslim groups, and San Francisco Bay Area privacy advocates wrote “A web of surveillance technology is rapidly spreading across our urban landscapes.” They urged the city council to take action against this mass surveillance. While the government argues over using the data to better map the city and solve crime, it’s definitely undermining the privacy of masses who are just getting by their day. The last thing anyone wants is to be recorded and stored on a server, and later to have their information be exposed in a massive hack which are getting pretty common these days. Earlier in Jan 2018, a debate over a controversial law gave the US government broad powers to spy on its citizens and foreigners purposefully. This meant saying goodbye to your internet privacy, something which we never had, I guess? According to a section of the Foreign Intelligence Surveillance Act (FISA), Section 702, the US intelligence agencies have the full power to collect the email communications of foreigners living abroad in order to obtain information about potential threats against the United States. In an effort to safeguard the US from threats, the intelligence agencies examine emails sent by or to Americans as well. As a citizen or politician who deeply values privacy, I’m sure you’re not the only one who’s worried. It’s not the first time that internet privacy has been shackled. Net Neutrality and Broadband Privacy rules give power to your Internet Service Providers aka, ISPs to monitor, store and share your internet activities with third-parties without your approval. If that’s not a crime then I don’t know what is. Privacy is a fundamental right and it should be respected by all parties. Without the necessary security measures, we’re all doomed and exposed on the web. A notorious website host’s direct links to security cameras from around the globe. A person who claims to be a Russian hacker has hacked his way to your security cameras that are connected to the internet. FYI, there are tons of known exploits available on the Google Exploit Database regarding cam exploits. This is a very common security threat that everyone should be aware of and prepare for! The website which claims to be the world biggest directory of online surveillance security cameras exposes hundreds of thousands of moments that you call private. Sadly, those moments may have ended up on this website and are viewed by millions of people across the globe. Streaming a security camera is easy on the website. All it requires from you is to select a country where you want to watch live street, traffic, parking, office, road, beach, earth online webcams. Security cameras affected by this hack are from renowned brands such as Axis, Panasonic, Linksys, Sony, TPLink, Foscam and a lot of other network video cams available online without a password. The problem is fairly basic and easily identifiable. We forget to change the default password of the security cameras that we install for our ‘security.’ As ironic as it may seem, that’s the real problem we must address before employing security tools. Unsecured security camera in people’s homes are mostly the ones that end up being targeted, hacked and exposed online. Hackers and cybercriminals have developed ingenious tools that spy through your Wi-Fi router and not only do they record your internet activities but possess the ability to stream through any camera that you’ve connected on that particular Wi-Fi network. Your Internet Protocol or IP is a gateway to the rest of the world. Think of it as a passport that’s required on the internet. Now just imagine that your internet passport gets hacked and duplicated. That’s not an ideal situation you want to be in. Privacy at this age is severely under threat from all angles and it’s high time you move towards a privacy-centric approach before falling a victim to despicable acts. While you are unable to secure yourself against surveillance cameras in public places, you can definitely secure your home cameras by employing encryption from the ground up. This means securing your Wi-Fi router. Since a Wi-Fi router is the first line of defense, it must be secured against malicious actors at all times. While changing the default password of your security camera and Wi-Fi router is an initial step, it’s definitely the right step towards a more private life. To secure your unsecured cameras and Wi-Fi connection, you should equip your router with a VPN. How will a VPN help? Interesting question. A VPN assigns you an IP of its own and masks your real IP from intruders. With a VPN IP, you can carry on with your online activities without worrying about your real IP getting exposed. Additionally, you get AES 256-bit military grade encryption that encodes your data into secure packets that are undetectable and untraceable. This means the transmission of your camera footage and internet communications are completely secure. Don’t wait to restore your online privacy as waiting only enhances your risks of falling a victim to online hacks.